It's been something of the elephant in the room in the NBA, a potential stain, even an embarrassment, that no one wanted to acknowledge. This great league with this great history didn't have a JaKarr. Perhaps now it will. 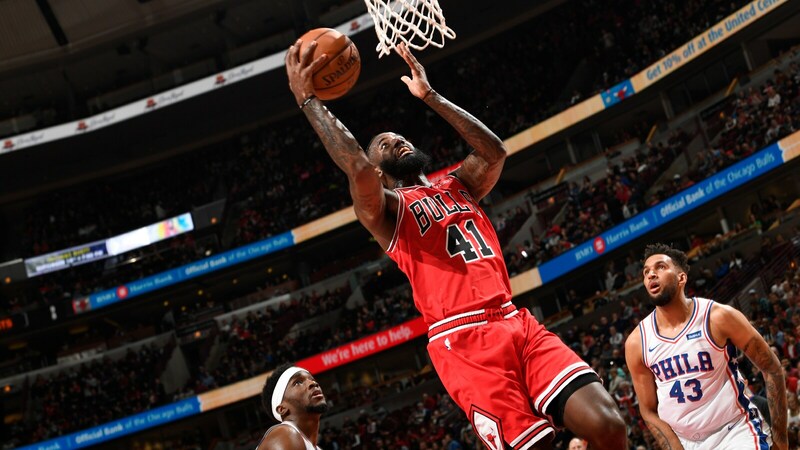 "If you go through enough ups and downs, I feel like everyone starts questioning," JaKarr Sampson was saying late Saturday night after his career-high 29 points wasn't quite enough in the Bulls 116-96 loss to the Philadelphia 76ers. "But if you stick with it, I am proof the outcome can be good. We'll see what happens with it." Perhaps it finally will mean a regular job in the NBA for the G-league veteran who spent this winter commuting between Hoffman Estates and the Windy City Bulls and the Shandong Golden Stars in eastern China about 300 miles south of Beijing. "The way the money is over there, I was definitely, like, 'Yeah, maybe I'll stay over there. I'm not going back to the G-League,'" Sampson said with a laugh. "But it's everybody's dream from the States. They want to play in the NBA. That's a kid's goal from day one. If you don't have to, you don't want to be in China. I just took advantage of my opportunity. I'm glad I'm here." The Bulls seem to be as well. It's obviously a somewhat small sample, three games with the Bulls. But Sampson is averaging 23 points, trailing only Zach LaVine's 23.7 for leading scorer this season. The Bulls, 22-58, are going to have difficulty winning many games with basically every regular starter out injured or undergoing testing. Zach LaVine and Kris Dunn haven't been officially declared out for the final two games, but it seems certain since neither has practiced. Otto Porter Jr., Lauri Markkanen, Wendell Carter Jr., Denzel Valentine and Chandler Hutchison all have been ruled out for the season. So the Bulls close out the disappointing 2018-19 campaign home against New York Tuesday and in Philadelphia Wednesday with Robin Lopez and nine guys who have played in the G-league. The only other Bull to score in double figures Saturday was fellow former 76er Timothe Luwawu-Cabarrot with 14 points. Walt Lemon Jr. had his scoop shot swatted into the stands several times. But Lemon tied Windy City teammate Sampson for a team-best eight rebounds and had a team-high five assists. Lemon also recorded an unusual milestone, according to the Bulls, becoming fourth Bulls player in franchise history to have 11 or more steals in his first four games of a season. The 76ers have been stumbling in trying to wrap up the third seed in the Eastern Conference. So Joel Embiid despite an ankle problem played and had 20 points, 10 rebounds and three blocks. Jimmy Butler was out with a back issue, but J.J. Redick had 23 points and Tobias Harris 16. However, thanks mostly to JaKarr Sampson (the Bulls have a G-League Brandon Sampson, too), the Bulls were tied at 42 late in the second quarter before the 76ers tightened the defense and led 57-49 at halftime. Sampson was huge in that second quarter, scoring 15 straight Bulls points to start the quarter and get the Bulls a lead against the loaded 76ers. But before Sampson could come off the beach in the third quarter, the 76ers had taken a 16-point lead and the Bulls weren't able to get much closer. "He's just a tough dude, he's got a motor," Bulls coach Jim Boylen said about the 6-9 forward. "He gets to that right hand, it's over. I think he's shown a little bit more to his game even than he had in (Bulls preseason) camp. He's got the flip shot now. He's got a little jump hook now. He can counter to his left hand, so he's grown. And he's not scared, which I love. He feels he belongs, which I love. The way he's played has been great for him and great for us. "I'm a little bit shocked that he wasn't picked up or he didn't end up somewhere (in the NBA) this year with his size," Boylen acknowledged. "Guys his size that can do a lot of things are valuable now. He's improved his free throw shooting, he's improved his three-point shooting, he can handle the ball in the open court. He's matured, and he's got a poise about him out there where he just plays. And he's got a great motor." 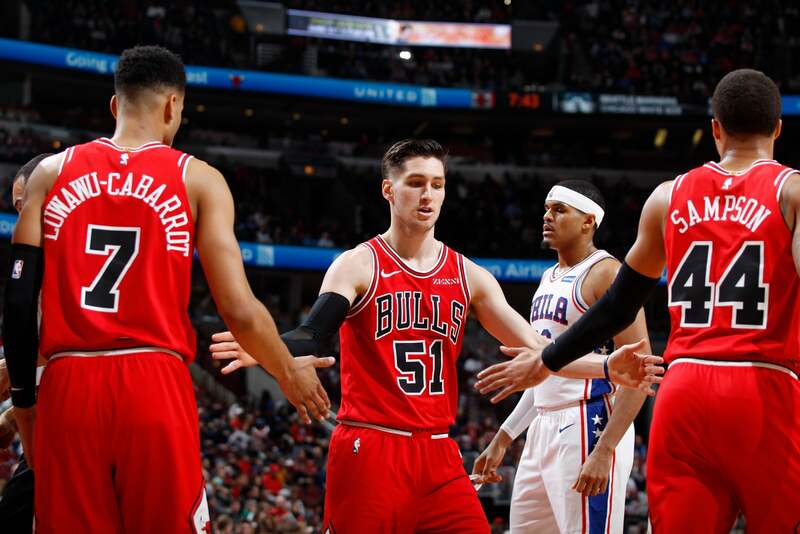 If the Bulls cannot contribute many wins to their record—they're locked in now to fourth poorest record in the league—they've been able to find some overlooked talents in players like Lemon, Ryan Arcidciacono, Shaquille Harrison and Sampson. Though Sampson was the leading scorer for Windy City this season at 21.1 points per game and a stretch power forward, it seemed he wasn't going to get an NBA chance. He was packing his bags in Hoffman Estates to go home to Cleveland when he got the last minute Bulls call last week. He knows the 76ers' process having been with them in 2014-15 after being undrafted out of St. John's. He was a smallish, defensive-oriented forward who couldn't shoot. You know, like second round draft pick Draymond Green. Not quite as versatile, but NBA scouts don't generally like those types. Sampson made a 76ers team that was intentionally losing games for draft picks, but doing something clever. They didn't want to tarnish the players they'd retain, like Embiid. So they hired a bunch of players considered disposable. Sampson went through an 18-64 season and then much of 10-72 in 2015-16 before going to Denver and Sacramento. By then he'd been associated with too much losing. Windy City became his fourth G-league team at 26. But along the way while no one apparently was watching Sampson, thanks in part to former Windy City coach Charlie Henry's emphasis on shooting, became a competent three-point shooter at about 30 percent. His utility was on display in that second quarter with a three, a 21-foot pullup, fouled on a jumper for a three-point play, a spinning drive for a layup and a bookend three. Who knew when he played 15 total minutes over three games in preseason with the Bulls and was released. But he just went back to work with a good attitude, and perhaps the NBA finally will notice. "I'm thankful for the opportunity he's (Boylen) given me to play big time minutes like this in the NBA. It's not often it happens. I've just got to take advantage of my opportunity. That's what I'm trying to do, make the best of it," JaKarr Sampson said. "I feel like it's just God's timing, really. I feel like it's all about right place, right time, right coach, right situation, right opportunity. And I feel like right now, that's what you are seeing. I'm getting the minutes and I've been working on my game. "The NBA game has changed a lot in the last four or five years," he noted. "You've got smaller guys on the court at the four spot being able to create and switch one through five, one through four. I always had the defense. The offense is coming. I feel like I had a great season with the G-League team. But I just stay consistent and just continue to play hard, and when my name got called I was ready. When you're out the NBA, you get a different type of appreciation for it. Being in China, being across the ocean, you're really like, 'Man, I've got to take this chance and run with it.' And that's what I'm trying to do." The Bulls have had Jawann, Jabari, Jimmer, Jannero, Joakim and Jud. Time for JaKarr?